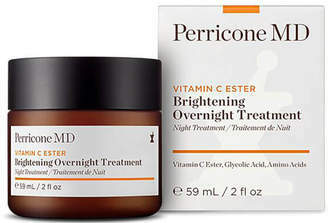 Wake up to radiant, youthful-looking skin with Perricone MD Vitamin C Ester Brightening Overnight Treatment ; a multi-beneficial formula that works to firm, hydrate and refine. The lightweight, anti-ageing cream utilises Glycolic Acid and and Vitamin C Ester (a highly stable and less irritating form of Vitamin C, which is fat-soluble and easily absorbs for maximum antioxidant benefits) to promote a smooth, bright complexion. Helps to minimise the appearance of fine lines and wrinkles, whilst targeting age spots, sun damage and discolouration for a more even tone. Expect toned, revitalised skin with renewed luminosity. Not tested on animals. Paraben free.